I recently had lunch with a friend and we were discussing body insecurities. Something every man, woman, and child has. No one is exempt from having them. In our conversation, I mentioned to her how I overcame one of my biggest insecurities. Having big arms. In my early to mid twenties, I hated showing my arms. I always felt they looked like big turkey legs. I used to try to avoid anything sleeveless and during the summer months, I would wear 3/4 sleeve tops and dresses, only to sweat my life away in 90 degree weather. Having fat arms is a major insecurity for a myriad of plus size women. In my opinion, its the equivalent of women of a certain age (regardless of size) who hate having that little batwing dangle from their arms as they get older. Wendy Williams always talks about hers. I used to get teased a lot about having big arms. Whenever I would walk down the street, I felt like everyone and their mother was staring at the turkey legs I had for arms. It wasn’t until I saw an episode of Oprah that I overcame my insecurity about my arms. She had Star Jones as a guest. This was right after Star finally admitted she had Gastric Bypass surgery. Oprah had mentioned how she used to admire Star’s confidence as a plus size woman and mentioned seeing her in a bathing suit on the beach or something to that affect. In that moment, I felt that I no longer wanted to feel restricted. I no longer wanted to hide my arms. What really stood out to me from what Star said, was at 300 pounds, she couldn’t hide anything. I realized that I was hiding. Something a lot of plus size women do when we are insecure. I thought by covering up my arms, no one would know that I have big arms. The truth is, I wasn’t fooling anyone but myself. I was and am a big girl and I have big arms. So what (In my Tyra Banks voice)! From that episode on, I never hid my arms again. Even now, when I am bigger than I was in my twenties, I wear sleeveless and strapless. I’m not going to allow my insecurities or other people’s negative comments stop me from living my life or wearing what I want. I encourage you to work through your insecurities and wear the things you thought you couldn’t. This summer, I felt my insecurities creeping back up but I decided I won’t let it get the best of me. 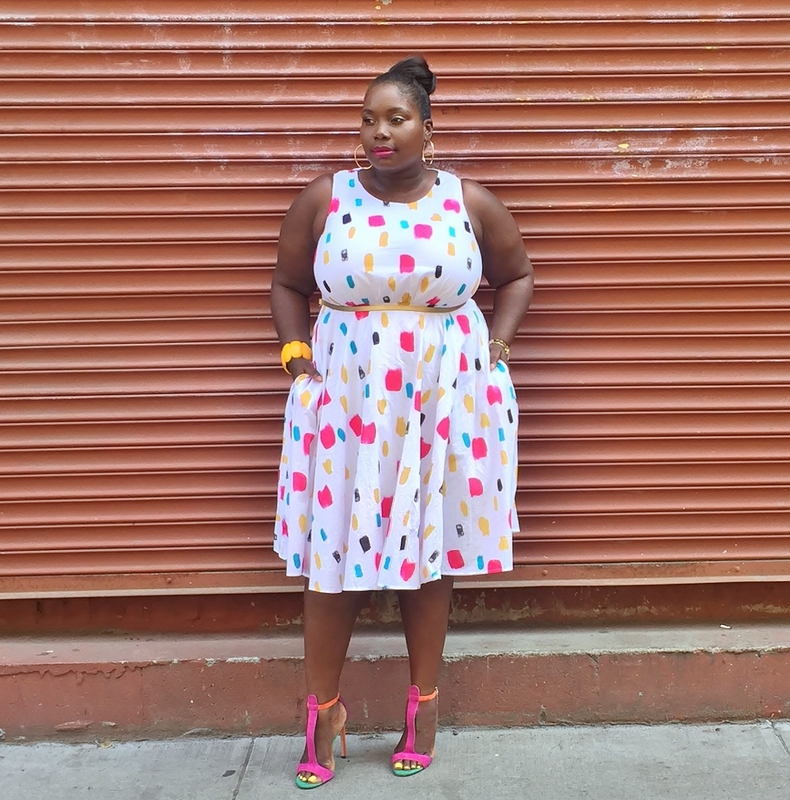 So, last week, I slipped on this sleeveless white paint splattered dress from Lane Bryant and strolled through Greenpoint Brooklyn with confidence. This wasn’t fake confidence. This was true confidence for me because I never want to hide or feel ashamed of my body ever again. 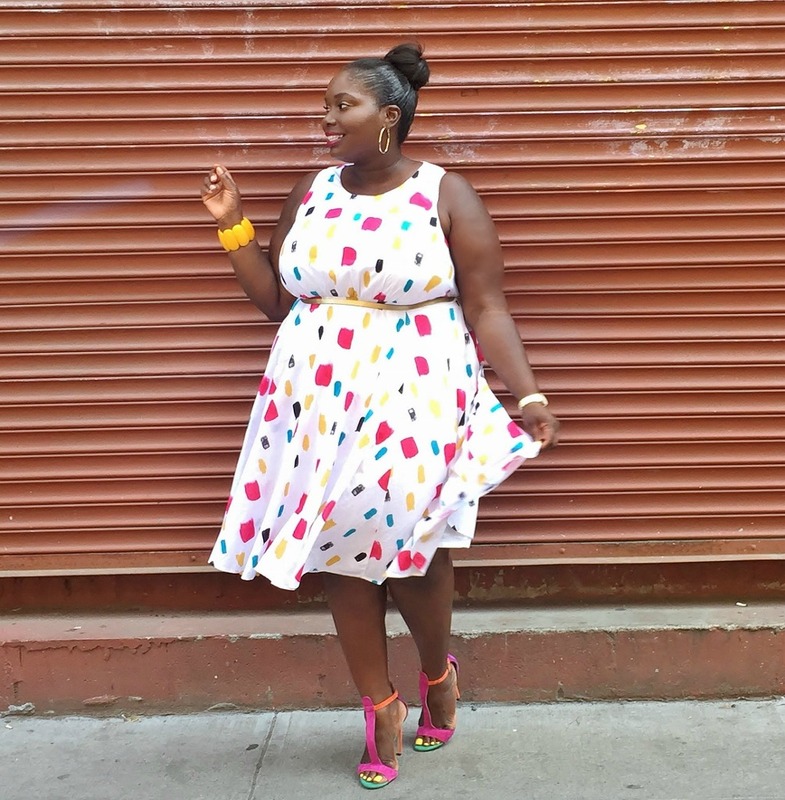 I thought this Lane Bryant dress was super cute. It boosted my confidence even more. 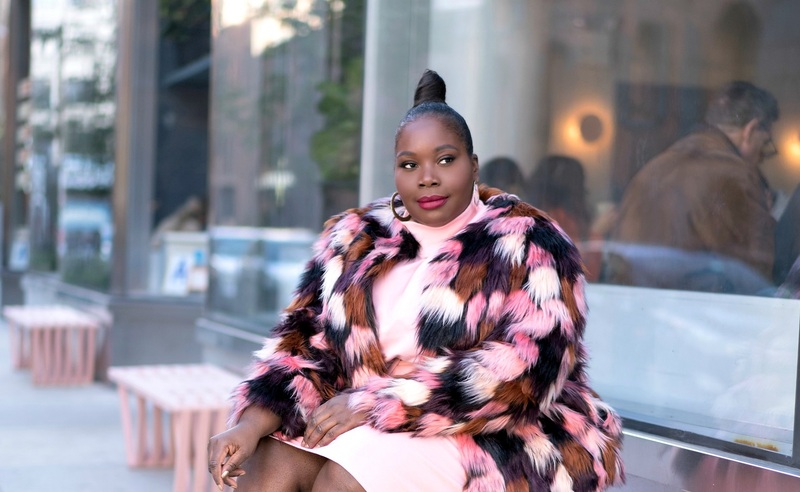 While many plus size women sometimes hate clothes. I’ve always used clothes as a confidence builder. Finding a piece of clothing that makes you feel and look your best is an instant confidence booster. How have you overcome one or any of your body insecurities? I read this article and found it very interesting, thought it might be something for you. 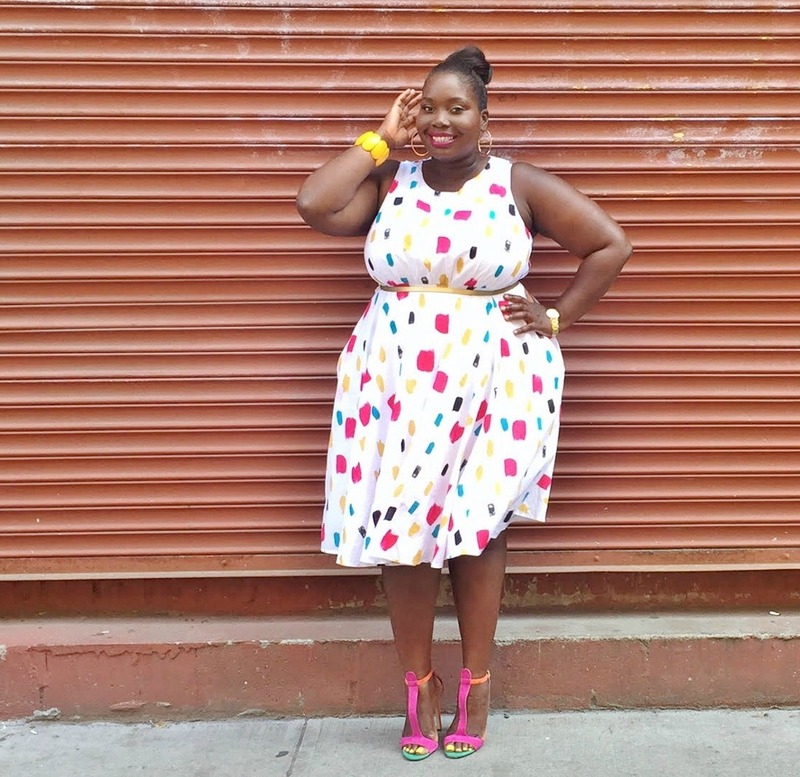 The article is called How I Got Over Hating My Fat Arms And Embraced Sleeveless Dresses and is located at https://stylishcurves.com/got-hating-fat-arms/. I’ve always hated my arms i wouldntgo bare unless my entire upper arm was covered so short sleeves was a no until just this summer i realized how ridiculous i look and felt and just stopped caring. So what if people see your fat? You are beautiful regardless!! I am proud to say today was the first time I’ve wore shorts ever. I had a car accident whe i was 9 and had my knee reconstructed so theres scars galore and i didn’t care i felt fabulous. My insecurity was not the size of my arm but the stretch marks that were on them. I’ve only only worn sleeveless in public once which was my wedding day and even then I spent a fortune on having a make up artist cover up my stretch marks. I see all these cute sleeveless outbid that I know that I could never wear them. I’m just super uncomfortable at all the stretch marks. I like your dress, the colors are fun. I too, have struggled with this issue. Your article gives me confidence. I am so tired of wearing shrugs. You look great in that dress! I have upper arm insecurities, too, but this year I bought a couple of cute sleeveless tops and I love them. I — USED to have insecurities about my upper arms too, but just think….there are some people who don’t have arms at all!!!!! How about that????????? Always be thankful!!!!! Exactly! And what they wouldn’t give to have your arms, my arms, any arms…fat or not. I finally had to tell myself I am beautiful at any size and why should I hide away or sweat to death covering up all the time. 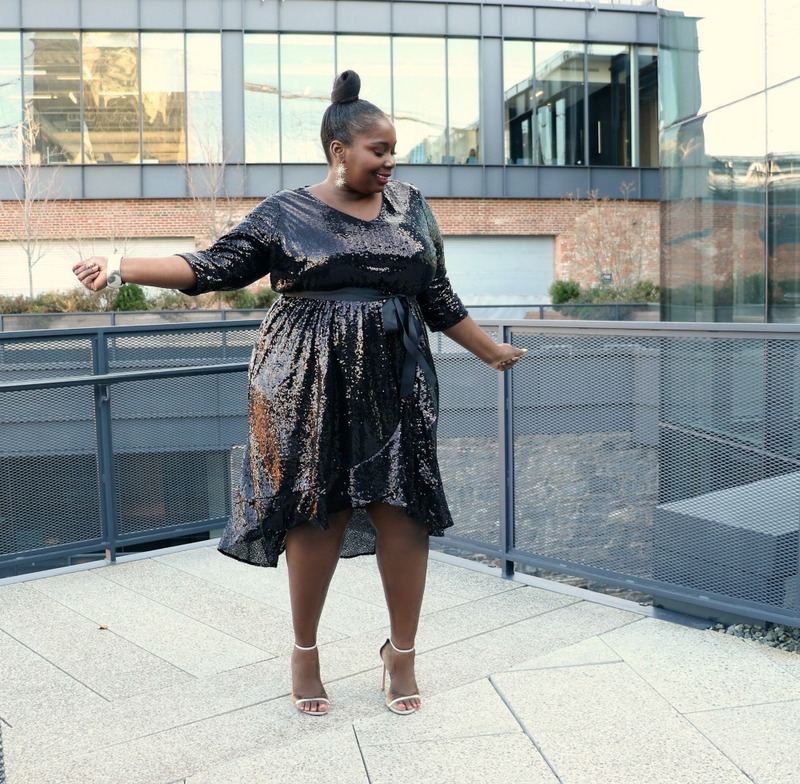 I have a cruise coming up in less than a month and I found your post by searching for…you guessed it, sleeveless dresses for girls with curves. Thank you!